Climate change has a disastrous impact on urban infrastructures and services. And Delhi citizens are no strangers to challenges such as air pollution and urban flooding. The capital has been making headlines for the dangerously rising air pollution levels ever since a World Health Organization (WHO) report in 2014 ranked it as one of the most polluted cities in the world. A 2014 United Nations report has also ranked Delhi among the top three most vulnerable cities to floods. This dangerous convergence of climate change and modern cities poses big challenges for citizens, especially those living in slums. Among them, women face multiple layers of discrimination over access to basic services and livelihoods. Drawing on these challenges, it is pertinent to explore the importance of gender-sensitive strategies to establish climate-resilient slums in Delhi. WHO says urban poor are the worst impacted by rising air pollution levels in Delhi. The Intergovernmental Panel on Climate Change (IPCC) stresses that cities in the developing world, and elsewhere, will be adversely affected by global warming induced climate disruption, leading to food and water shortages, along with higher temperatures due to “urban heat island effect”. Although the rural population is increasingly moving to cities for employment, slum dwellers face considerable challenges that are likely to increase in the context of worsening climate impacts. Since most slums are illegal, residents have a slim chance of procuring basic facilities such as clean water and sanitation, roads, energy and public transport. Water shortages, heat waves and floods trigger a chain reaction that affects other aspects of their lives such as health, livelihoods and capacity to withstand climate change impacts. However, existing climate policies do not address the vulnerability and risks faced by slum dwellers, despite the fact that they comprise 30 per cent of Delhi’s population. Of the vulnerable populations in slums, women continue to experience particular hardships. Gender inequalities permeate structures that determine access to resources and other basic amenities such as health, water and sanitation. These pre-existing inequalities are exacerbated by climate-induced events putting them at a further disadvantageous position. The linkages between gender and climate change have been clearly established in recent years. Women face unique consequences under the impact of climate change in slums. “Lack of water/power and necessary resources, crowded population in limited space, lack of hygiene, and awareness contribute to deplorable living conditions in the slums. Girls and women from slums are often subjected to gender-based violence and other dangers quite regularly,” says Kalyani Raj of the All India Women’s Conference. “In such conditions, the urban slum dweller is hardly aware of any climate-related disaster preparedness—much less of resilience. To them, almost every day is a disaster—whether caused by human or by nature,” adds Raj. Prevailing grim conditions in the slums force women to walk long distances through poorly lit and garbage filled streets to use toilets. Domestic responsibilities often fall on women’s shoulders which involve organising food and water for the family. These household chores prevent girls from attending schools regularly. These underlying discriminatory factors increase climate-induced risks for women since they have narrow access to rights and resources necessary to counter the impacts of climate change. What further reduces women’s capacity to cope with climate change is the asymmetry in wage, based on gender in urban areas. Therefore approaches such as slum upgradation should have special focus on building the capacity of women and children. This will not only improve their quality of life, but also strengthen their resilience to climate change. Some initiatives have coalesced efforts to bring to fore the gender dimensions of climate change in cities, given that much of the focus till now has been in rural areas. 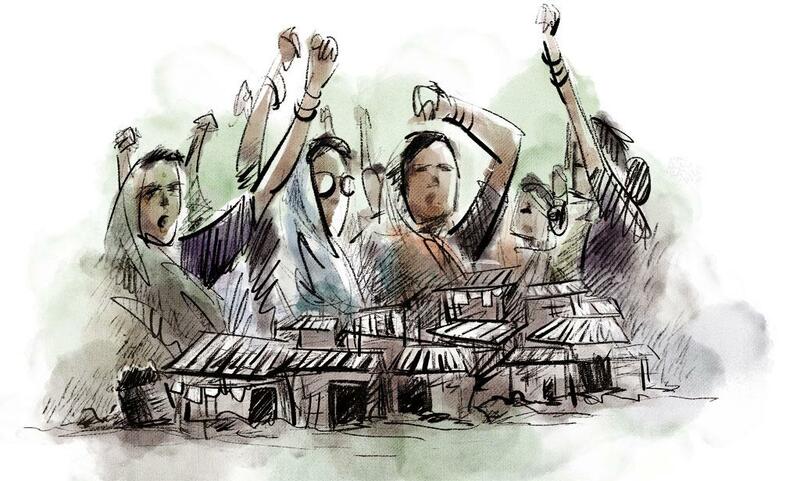 GenderCC—Women for Climate Justice, a global network working for climate and gender justice, has started an initiative for the inclusion of gender into climate adaptation in some pilot cities in India, South Africa and Indonesia. The Gender into Urban Climate Change Initiative seeks to establish knowledge and capacity among civil society and policymakers to integrate gender issues into climate policy. Against this background, it is pertinent to highlight how women in Delhi are converging efforts to build resilience against climatic impacts. In slums like Bhalswa and Bawana in Delhi, women’s groups have started to hold the government accountable for providing basic services. Community-level participation of women has spurred more toilet construction as well as street lights in the areas to ensure women’s safety. The groups now organise monthly meetings with the local councillor to communicate their needs and challenges. This aspect reflects a change in women’s level of participation in public dialogue. Their involvement in major issues such as clean water, waste management, affordable housing and land rights can go a long way in developing climate-oriented solutions in slums. Women devise solutions that are climate resilient and pro-poor. Pollinate Energy, a social initiative operating in the slums of Bengaluru, have organised women’s groups that have opted for cleaner energy such as solar. The shift has helped the families in two ways—solar power is cheaper and cleaner than kerosene lamps. Reduction in the gap to access climate viable technologies can act as a springboard to climate resilience even in Delhi slums. Bijal Brahmbhatt, director Mahila Housing SEWA Trust, says climatic events such as heat waves and water crisis, though not considered as extreme as floods and earthquakes, exert tremendous pressure on the life and livelihoods of urban poor, especially women. Her organisation provides localised technical assistance to women’s groups. For example, it assisted women from the slums of Odhav in Ahmedabad to make roofs formed of biodegradable polymer that help significantly reduce temperature during summers. Low carbon development practices in the realm of lighting and cooking are relevant to Delhi slums. To realise this aspect, adaptation financing and strong institutional structures are crucial. “Women can save up money much better than men in the informal settlements. They are also weaving innovative solutions against climate change, but the funds are not earmarked to enhance their adaptation strategies,” says Lisa Junghans from Germanwatch e.V, a global network that promotes north-south equity. Climate change gives rise to inequities that make those who are already vulnerable slip further into poverty. Environmental activist Vandana Shiva claims that the existing patriarchal nature of the Indian society silences women’s voices in climate solutions. However, she stresses the fact that women’s participation remains a fundamental component in strengthening adaptation strategies to climate change. Gender equality and sustainable urbanisation go hand in hand, as the Gender into Urban Climate Change Initiative seeks to demonstrate. In mega-cities, mobilising women into decision making and developing environmentally sustainable practices can bear a direct outcome on improving living conditions in slums. Equipping women to face climate risks will help build long-term resilience and change and maximise women’s voices in decision-making at the community as well as household level. (This article appeared in the 1-15 November, 2017 issue of Down To Earth).